Today in Masonic History Charles-Theodore-Henri De Coster is born in 1827. 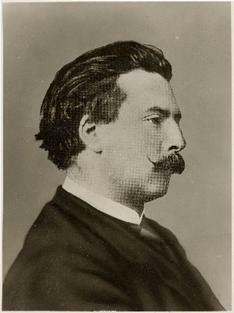 Charles-Theodore-Henri De Coster is a Belgian novelist. De Coster was born on August 20th, 1827 in Munich, Germany. His family was living there at the time because his father was part of the household of the Apostolic Nunciature to Bavaria, a diplomatic post of the Holy See. Before long the family moved back to Liège, Belgium. In 1850 De Coster entered the Universite Libre de Bruxelles where he graduated from in 1855. He also was one of the founders of Société des Joyeux a small literary club. Several members of the group achieved literary distinction. In 1854 De Coster had his poetry first published in the Belgian periodical Revue trimestrielle. Some of his early prose were published in Uylenspiegel another Belgian periodical. De Coster worked hard to familiarize himself with 16th century French. He said that Flemish manners and speech could not be rendered properly and faithfully in Modern French. Some of his best works would be set in the 16th century utilizing 16th century French. He did also publish works in Modern French. De Coster's greatest work was The Legend of Thyl Ulenspiegel and Lamme Goedzak. The novel was a 16th century romance. It was not popular in Belgium because it didn't meet up to the conventional standard of Belgian Nationalism, it was very popular in the rest of the world. His title character Ulenspiegel has been compared to Don Quixote. The book follows the exploits of Ulenspiegel in a semi-historical story. It is full of racy humor and, at times, barbaric acts. De Coster's works were never financially profitable. In 1870 he became professor of general history and French literature at a military school. De Coster passed away on May 7th, 1879. De Coster was a member of Les Vrais Amis de l'Union et du Progrès Réunis which was part of the Grand Orient of Belgium. He was initiated January 7th, 1858.